Today, I continue my series, analyzing the picks of every NFL team in the 2014 draft. Since these players have yet to set foot on an NFL field, I don’t do draft grades. I don’t believe a draft should be graded for at least two years, which gives players some time to develop. The purpose of this article is to discuss the players drafted, how they may fit in with their new team and talk about the competition they will face to get on the field. Each article will focus on one division. 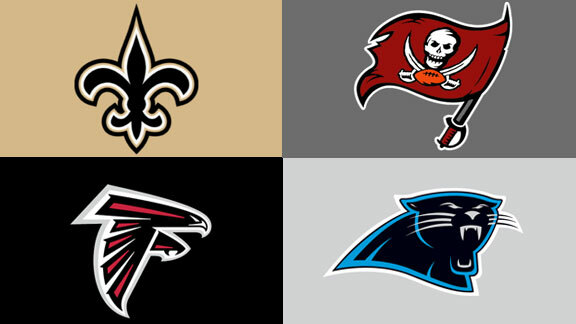 Today I look at the NFC South. With their first two picks, the Falcons decided to improve the offensive and defensive line. They needed to become more dominant at the point of attack. The two picks they made give them the chance to do just that. Most draft analysts had Greg Robinson of Auburn as their top tackle, but I had Matthews as my top tackle. The NFL is a passing league and Matthews is an outstanding pass protector. His dad is NFL Hall-of-Famer Bruce Matthews and he was likely kick sliding at the age of three. The Falcons needed someone to protect their investment in quarterback Matt Ryan. Matthews may have been the best player available to keep Ryan upright. With Sam Baker on the left side, it looks like Matthews will be the starter on the right side, but he can always switch over to the left side if needed since he played on both sides in college. The opinions on Ra’Shede Hageman varied. There is no mistaking the physical talent. At times Hageman completely dominates games. The issue with him was consistency. At times he just disappeared. He has the size (6’6” 310 lbs.) to be a dominant inside force if he can put it all together. It appears that the Falcons may play him at nose tackle, but I could also see him playing defensive end in their 3-4 defense. If he stays at nose tackle, he will start out behind Paul Soliai. If he moves to defensive end, he will be behind Tyson Jackson and Jonathan Babineaux. I think the worst case scenario is that he is in the rotation at one (or both) of the positions and probably move inside to rush the passer in nickel and dime schemes. Dezmen Southward is a versatile player with good speed and athleticism. He ran a 4.38 40 yard dash and vertical jumped 42 inches. Southward has played both corner and safety and has experience covering slot receivers. The Falcons have him listed at free safety behind Dwight Lowry. He is a good special teams player and should make his mark there while also getting some reps in nickel and dime sets. Devonta Freeman is a running back that likes to run downhill. He has a slashing running style and has good hands. Steven Jackson will turn 31 in training camp and missed 4 games last year due to injury. Jacquizz Rodgers is more of a change of pace and 3rd down back. I can see Freeman getting some touches this year and possibly becoming the starter in 2015. Prince Shembo played outside linebacker for the Irish. It looks like the Falcons may look at him playing inside. Shembo is a strong player that runs well to the ball, but is a bit tight in the hips. The Falcons drafted two other inside linebackers, so it will be interesting to see if he stays inside. The two starting inside linebackers are Paul Worrilow and Joplo Bartu. Ricardo Allen is a competitive corner that lacks ideal size and speed. He makes up for his physical limitations with good instincts and ball skills. Allen had 13 interceptions in his career and he returned four of them to the house. He will have to make an impression in training camp if he is to make the team. He will have Desmond Trufant and Robert Alford ahead of him and they were picked in the 2013 draft. The backups are Robert McClain and Josh Wilson. The Falcons next two picks were on players that played inside linebacker in college, Marquis Spruill and Yawin Smallwood. Spruill is an intense player that is always around the ball. He is a big hitter that closes well and ran a 4.59 40 yard dash at this pro day. Smallwood does a better job chasing the ball that plugging the hole, however, he has the range to go sideline to sideline. He might be a better fit as an outside linebacker, although the Falcons have him listed on the inside right now. I would think that Shembo, Spruill and Smallwood would all have chances to get reps this year, with possibly two of them eventually becoming starters. Tyler Starr was the fourth linebacker that was drafted by the Falcons. He had a good combine and also played well in the East – West Shrine Game. Starr is raw, but gives good effort and appears to be coachable. If he can’t make the 53 man roster, look for him to be on the practice squad. The Panthers were hurting at receiver after cutting Steve Smith and losing Ted Ginn Jr, Domenik Hixon, and Brandon LaFell in free agency. They absolutely had to take a receiver with the first pick. Sammy Watkins, Mike Evans, Odell Beckham and Brandin Cooks had all been taken. Kelvin Benjamin is a big receiver with a huge catch radius. Benjamin is 6’5” and has 35” arms and has the ability to catch the ball at its highest point which makes him a beast in the red zone. Benjamin doesn’t have great speed, but his long strides can be deceiving, causing the defender to get beat deep. With only Jerricho Cotchery and Jason Avant in front of him, Benjamin should have no problems getting playing time. Early in the draft process, Kony Ealy was looked upon as a 1st round pick, however, as time went on, he started to fall. The reason was mainly a concern with his motor since his game tape was very inconsistent. Ealy’s sack numbers increased each year, but he never got above 8 sacks in a season. Most teams want more production out of a 1st round pick. He has good size, speed and quickness, but needs to spend some time in the weight room. In the NFL, you can’t count on speed alone to get sacks. Carolina has Charles Johnson and Greg Hardy at defensive end, so Ealy should be given some time to develop and will likely get snaps in special packages. Trai Turner tested well at the NFL Combine. He was the only guard to run the 40 yard dash in less than 5.00 seconds (4.93) and also had 1.73 10 second split which was the best time at his position. Turner will need to work on his strength at the next level if he is to become a productive run blocker. The Panthers have Amini Silatolu and Garry Williams as their starting guards. Turner will likely have a good shot at the starting spot next year after spending a year in the weight room. Tre Boston has experience at both corner and safety. He doesn’t have great athleticism and can at times take inaccurate angles. The starters at safety are Robert Lester and Thomas Decoud. They also have Roman Harper and Colin Jones, so he may get more action as a special teamer until he develops. Bene Benwikere has average speed, but has very good ball skills. When the ball is in the air, he plays it like a wide receiver. Benwikere has the ability to cover slot receivers, but he has to beat a numbers game to make the 53 man roster. The Panthers have Antoine Cason, Melvin White, Josh Norman and Josh Thomas as their top 4 corners. If Benwikere makes the roster, he will have to beat out James Dockery, Charles Godfrey and DeQuan Menzie for the 5th corner spot. If he looks good on special teams, that might give him the edge to make the opening day roster. Tyler Gaffney gave up football for one year to try his hand in baseball with the Pittsburgh Pirates organization. Gaffney came back and played football for his senior year and rushed for over 1,700 yards for the Cardinal. He has good size and runs well between the tackles. He may have a hard time making the opening day roster since the Panthers already have Deangelo Williams, Jonathan Steward and Kenjon Barner. The Saints over the last couple of years have had some turnover at the receiver position. Brandin Cooks is a slot receiver that isn’t big (190 pounds), but he is extremely fast and quick. His 4.33 40 yard dash was the second fastest time at this year’s NFL Combine. Once he makes the catch, he has the ability to make people miss and turn short throws into long gains. The Saints have Marques Colston, Robert Meachem and Kenny Stills, but I believe Cooks will be able to get on the field in multiple receiver packages. With Darren Sproles gone, Cooks could be the same type of receiver for the Saints. I believe Drew Brees will love this guy! Stanley Jean-Baptiste is a versatile player that has played receiver, corner and safety. If he is able to play corner, his 6’3” size will make him the type of corner that teams want to copy the Seattle defensive backs. Jean-Baptiste could be a physical presence that could dramatically improve the Saints defense. The Saints starters at corner are Champ Bailey and Keenan Lewis with Corey White and Patrick Robinson as the backups. Jean-Baptiste should be able to get on the field in nickel or dime packages this year and possibly take over for the 37 year old Bailey next year. Khairi Fortt has good size and speed. He has the ability to chase plays sideline to sideline. Fortt bench pressed 30 reps of 225 pounds at the NFL Combine. The Saints starting inside linebackers are David Hawthorne and Curtis Lofton with Ramon Humber and Kevin Reddick as the backups. Fortt should have the ability to play special teams and may get some defensive reps in certain packages. I was surprised that Vinnie Sunseri declared for the draft. Sunseri has flashed the talent, but he tore an ACL late last season. I believe he would have been better served getting one more year under his belt at the college level. Sunseri showed a ball hawking ability before injuring his knee last year. He had two interceptions in the first two games of 2013 and he returned both of them for touchdowns. Sunseri will start off behind Kenny Vaccaro, Jarius Byrd, Marcus Ball and Rafael Bush on the depth chart. He may have a hard time making the final roster. I believe the best thing for him would be to spend a year on the practice squad and then compete for a backup position in 2015. Ronald Powell is an extremely fast, athletic linebacker. The issue with Powell is keeping him on the field. He sat out the entire 2012 season after tearing his left ACL twice. Powell also missed 3 games last year. If he can overcome the injury bug he could be the type of player that Defensive Coordinator Rex Ryan could use in a variety of ways. Powell will start out behind Junior Galette, Parys Haralson, Keyunta Dawson and Victor Butler on the depth chart. I’m interested to see if he makes the 53 man roster or if he ends up on the practice squad. He has the talent to make the team, but you can’t make the club in the tub. The Saints final pick was Tavon Rooks. He played right tackle for the Wildcats and he is a typical college right tackle. Rooks isn’t extremely athletic and shows stiffness in his movements. He is a much better run blocker than pass protector. I don’t see him making the roster, but he might make the practice squad. The Tampa Bay Bucs receiving corps looks more like a basketball team than a football team. The Bucs already had 6’5” Vincent Jackson. Their first two picks this year were Mike Evans, a 6’5” receiver and Austin Seferian-Jenkins, a 6’5” tight end. When quarterback Josh McCown gets in trouble, he should just be able to throw the ball up and let one of these big targets go get it. Mike Evans was a big part of what made Johnny Manziel so successful. Manziel was able to just put the ball high in the air and let Evans go up and get it, especially around the end zone. Evans has average 4.53 40 speed, but his long strides are deceptive and allow him to get past defenders. He should be the starting wide receiver along with Jackson. Austin Seferian-Jenkins is a big tight end that can line up all over. He seems to have good speed, although he was not able to participate in the Combine or his pro day because he had surgery for a stress fracture in his foot. It looks like the Bucs may use a lot of two tight end formations and if they do Seferian-Jenkins will get significant playing time. The Bucs also have Brandon Myers, who will be their shortest member of the starting receiving corps at 6’4”. Charles Sims is a versatile running back that played for the University of Houston then transferred to West Virginia after graduation. Sims has good size and speed and excellent hands. Sims has Doug Martin, Bobby Rainey, and Mike James in front of him, but I can’t imagine that he wouldn’t make the team. Sims is too valuable in the passing game to not make the 53 man roster. Kadeem Edwards is a very raw guard from a small school. Edwards has a good body type for a guard, low center of gravity and long arms. He is known for pancaking defenders, but he doesn’t have great technique. The Bucs starters are Carl Nicks and Patrick Omameh. If Edwards is to make the team, he will have to beat out Oniel Cousins or Jamon Meredith to claim a backup spot. Kevin Pamphile is a very athletic left tackle. He has quick feet and good speed (4.94 40 and 1.77 10 yard split). He is a raw player that arrived at Purdue as a defensive tackle, but later converted to left tackle. My guess is that he will be on the practice squad, but he has the physical tools to make the final roster. The Bucs starting tackles are Anthony Collins and Demar Dotson with Jason Foster and Jace Daniels as the backups. If Edwards looks good in camp, he could nail down a backup tackle spot. Robert Herron is a small wide receiver that shies away from physical contact. He doesn’t like to go over the middle and at times gets alligator arms. If he makes the club at all, it will be on the practice squad. Next Wednesday, I will be posting my analysis on the NFC West. If you like what you read, please like us on Facebook and recommend us to your friends. This entry was posted on June 25, 2014 by draftmaniacs in Draft Analysis and tagged 2014 NFL draft, Atlanta Falcons, Austin Seferian-Jenkins, Brandin Cooks, Carolina Panthers, Dwayne Wilton, Jake Matthews, Kelvin Benjamin, Kony Ealy, Mike Evans, New Orleans Saints, NFC South, NFC South Draft, NFL, NFL Draft, Ra'Shede Hageman, Stanley Jean-Baptiste, Tampa Bay Bucs.